Which Motorcycle GPS Navigators Are the Best? Most of us are familiar with the GPS navigation systems that can be found on the dashboard of the average automobile, but there are GPS navigators that are specifically designed for motorcycles as well. A motorcycle GPS is an excellent investment for the motorcycle enthusiast who loves taking long rides in unfamiliar areas, but doesn’t want to be bothered with reading maps. This handy gadget helps to eliminate stress and guesswork by making trip routing and planning much simpler and more convenient. In addition to offering turn-by-turn guidance on the road, it also assists you with finding certain points of interest such as lodging areas, food stops, gas stations, and ATMs. Many motorcycle GPS units also come with Bluetooth wireless capability, enabling you to communicate with fellow riders while you’re on the road. A motorcycle GPS device functions in a similar manner to an automobile GPS in that it utilizes the same satellite networks in order to pinpoint locations and calculate distances from practically anywhere in the world. They differ, however, in certain specific elements of design and usability. For example, most motorcycle GPS devices are built to a sturdier standard than their automotive counterparts; this is because a motorcycle GPS must be able to withstand the constant vibration of the motorcycle, in addition to being more exposed to the elements. As a matter of fact, most motorcycle GPS manufacturers construct their devices with fuel/water resistant casing as an extra safety precaution. Another important distinguishing feature of motorcycle GPS devices is that they typically have larger touch screen icons that are more suited for gloved hands. When it comes to determining the best motorcycle GPS devices, it is nearly impossible to leave top manufacturers such as TomTom and Garmin out of the conversation. TomTom’s flagship motorcycle GPS product is the Rider, a feature-rich navigational system that boasts “Lifetime” maps for 45 different countries, as well as Bluetooth connectivity. The Rider also features a USB 2.0 port to facilitate connection with your computer. 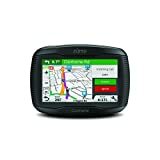 With this device, you can plan your entire route on your computer before uploading it to the GPS device. In addition, it can keep a record of your trip in its entirety so that you can upload it and share it with friends. The Rider features waterproof construction with a rating of “IPX7“, which means it can be immersed in one meter of water for 30 minutes before being damaged. Another neat feature of the TomTom Rider is the ability to listen to your GPS navigational directions in your helmet by way of Bluetooth wireless connectivity. As long as you have a pair of Bluetooth-friendly earphones, you’re good to go. The Rider offers you the flexibility of choosing a “winding route”, meaning the route with the most twists and turns, in order to make your ride as enjoyable as possible. Another feature worth mentioning is the charging bike dock, which enables the device to be automatically turned on or off in sync with your bike’s ignition. Garmin is another prominent motorcycle GPS manufacturer, and many biking enthusiasts consider the Garmin Zumo to be one of the best GPS systems available on the market. Their 590LM model boasts a five-inch display screen that offers exceptional clarity. The Zumo display screen is also sunlight-readable, and it features dual orientation, enabling you to position it either horizontally or vertically with equal visual quality. The Zumo also comes equipped with an MP3 player, and it offers you the ability to control your iPod or Pandora mix straight from the display. One of the more unique features of the Zumo 595LM is its compatibility with Garmin’s “Tire Pressure Monitor Sensor” accessory (sold separately), enabling you to keep tabs on your tire pressure by way of your GPS unit. Both Garmin and TomTom offer a quality product, but as with many other electronics items, you will need to determine which features are the most important to you and then select your GPS navigation system accordingly. Much like the myriad of smartphones available today, most motorcycle GPS systems come with dozens of features that may or may not find their way into your daily routine, and where one GPS unit excels, another one may come up short. For this reason, it is necessary to do your homework and determine what your personal priorities and “must-haves” are before settling on a particular brand. Once this is done, you can enjoy the open road with an excellent navigational aid to help guide you along the way. I am trying to understand if the tom tom rider 5th edition 4 inch allows us to simultaneously select then redefine a route or not. That is I want yo look at the route it generates then use some kind of method to both CHANGE and SAVE the route. Then I can take the back roads of my choice.